How one talented staffer has shaped the pages of Portland Monthly. 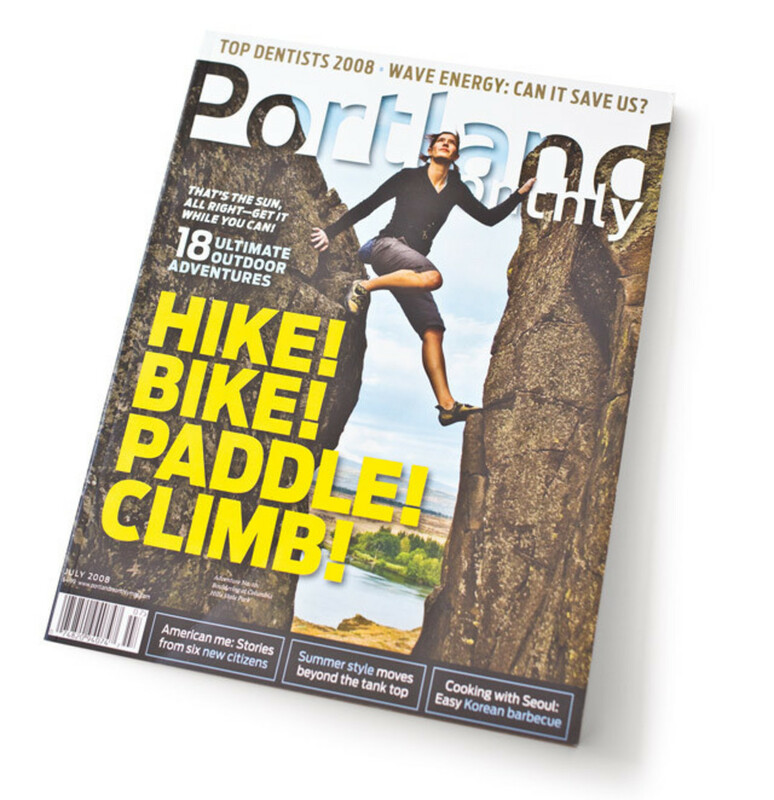 One of the only times a Portland Monthly staffer ever appeared on the magazine’s cover, she was captured between a rock and hard place—another rock. The headline: “Hike! Bike! Paddle! Climb!” The staffer: senior editor (and rare Oregon native) Kasey Cordell. The reason? Obvious: as shoppers’ eyes drifted over People, Star, National Enquirer, and the like at the checkout stand, how could they not be drawn to this clear, compelling portrait of a strong woman confidently on the rise? Indeed, the image is also the reality: over the past seven years, our editorial team has watched her pull the magazine to a higher place. As we sent this issue to press, Kasey told us she will be leaving for a gig with our friends at 5280, Denver’s city magazine. Our sadness (and, well, panic) is tempered by our happiness for the opportunities ahead with a great city and publication. But the moment also seems ripe to pull the curtain back on how one talented staffer has shaped the pages in your hands. Kasey once revealed that she could beat her boyfriend in arm-wrestling. He’s got nothing to be embarrassed about. Since I arrived as editor in chief in May 2009, I’ve tangled with our longest-serving editor over countless decisions: the tone of an article, the selection of a photo, the turn of phrase in a headline, the direction of the magazine. The first few times, her brow literally furrowed, head tilted forward in resolve, I prevailed only by invoking the “I’m the boss” clause. But over the next four years, clashes that could feel like two bighorn sheep squaring off gradually shifted into the kind of rigorous, fun, affectionate debate that yields the best kind of work. Kasey has overseen many of what we in the biz call “service packages.” In short, if you’ve opened this magazine to discover a great hotel on a little-known river, a terrace to sip wine in an offbeat town, a stroll through a grove of rarely explored old growth, or (most controversially among our readers) a secret swimming hole, Kasey probably found it. She has traveled the entire Northwest, often on three-day, 900-plus-mile, 50-plus-stop tours. If that seems like journalistic fun and games (and only those who have never reported, written, and edited a service package would think so), Kasey has mastered plenty of other moves, from editing our features on the NCAA’s first openly gay Division I basketball coach and Oregon’s struggling hazelnut industry to writing an incisive investigation of military sexual trauma among female soldiers in the Northwest. Following the script of many of her fellow born-Oregonians, Kasey left once before and then returned. But, ever the contrarian, she’s now swimming against Stumptown’s endless tide of newcomers (and New York Times reviewers) and heading for the Mile High City. Kasey’s 2008 cover shot surely was iconic, but for Portland Monthly’s staff, the talent, spirit, and resolve we’ve all enjoyed in this colleague makes it nicely prophetic.